Pudong (a prime area) was created as a symbol of Shanghai’s economic renaissance, the centre of finance, China’s commercial and economic hub. Till recently primarily farmland, today its former tracts of agricultural land have been replaced by magnificent towers of steel and glass. Pudong is home to numerous financial institutions, such as the Shanghai Stock Exchange, Shanghai World Financial Centre, and the Lujiazui Finance and Trade Zone. 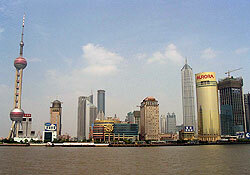 Pudong’s New Open Economic Development Zone helped Shanghai become the economic giant it is today. Yet Pudong also offers a large array of residential options, from the excitement of living downtown, to family-friendly housing compounds. Pudong’s numerous conveniences, including supermarkets, restaurants, shops and hospitals, make it a popular area to live in. Downtown Pudong, or Lujiazui, is the main business district, with its famous skyline and the impressively modern Oriental Pearl Tower and Jinmao Tower. The Binjiang neighbourhood in this area has affordable apartment compounds, and high-end apartment complexes offering breathtaking views of Huangpu River. Pudong has several other residential areas, many offering sprawling and laid-back neighbourhoods very different from the modernity of the downtown area. Many have first-rate facilities, which appeal to the many expats who relocate with families, such as Biyun (Green City) and the area of Jinqiao. There are well-stocked supermarkets, international schools, country clubs, garden villas, eateries, pools and golf courses. Many who live in Pudong find they enjoy its clean air and green spaces. Another popular area is the booming new area growing out of the Lianyang –Huamu International Resident Community. It has residences in contemporary apartment compounds, and newly-built generously-sized villas. Villa estates can also be found in the Oriental Century International Community (or Tang Town).